We are excited to be launching a new monthly beginners class at CitySport. The first Monday of every month, 8-9pm, will be a dedicated beginners session instead of our regular class. Although they will usually be the first Monday, due to the bank holidays, the first one will be Monday 27th April. 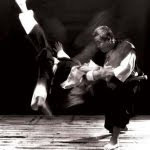 If you're interested in trying Shorinji kempo, why not come along and give it a go. Our regular drop in fees apply, but include one month's trial insurance too. There's no obligation - you can carry on coming along and paying drop in rates until the month's trial insurance is up, then you'll need to sign up for full annual membership of the BSKF if you'd like to continue.